Upgrade your GC or HPLC, by replacing paper recorders, integrators, and DOS-based data acquisition systems, and work with the latest generation of computing technology. 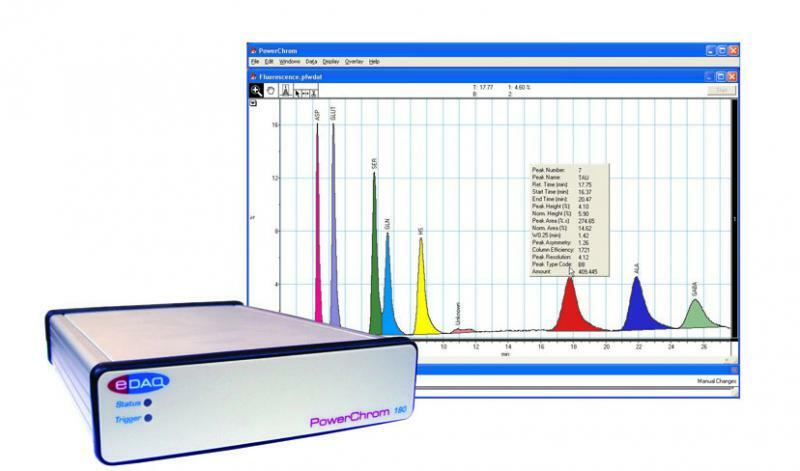 PowerChrom systems are used for the collection, display and analysis of chromatographic data on Windows computers. They can also be used for flow injection analysis (FIA) techniques using the optional Chart software with FIA extension. PowerChrom 180R System comprising PowerChrom 180 hardware unit and PowerChrom software. For one or two detectors; control for autosamplers fraction collectors etc. PowerChrom 181R System comprising PowerChrom 181 hardware unit and PowerChrom software. For one detector. Automatic or manual operation is possible (depending on you chromatograph configuration). Autosamplers and fraction collectors can be triggered with contact closure or TTL signals. Multi-run experiments are controlled via sequence documents.